Last weekend we attended our first wedding of our 2014 wedding season (windblown photo evidence above). I’m a rather seasoned pro wedding attender, watcher and even participant (as a bridesmaid). I’ve seen a lot of trends come and stay, so if you are looking for a new spin on wedding trends, I’ve got a few to offer. If you’re over the photo booth, try an illustrator! Hire an illustrator to draw take home pictures for your guests. If you are bored with the traditional wedding cake, go for cakes! Turn up cake tasting a notch by picking several smaller cakes in different flavors! If you’ve had one too many wedding color themed M&M’s, skip the candy bar and order late night snacks. Trust me – who wants candy after drinking for several hours? Help guests soak up the booze with sliders, fries, nachos, pizza and hot dogs. Your guests will thank you. 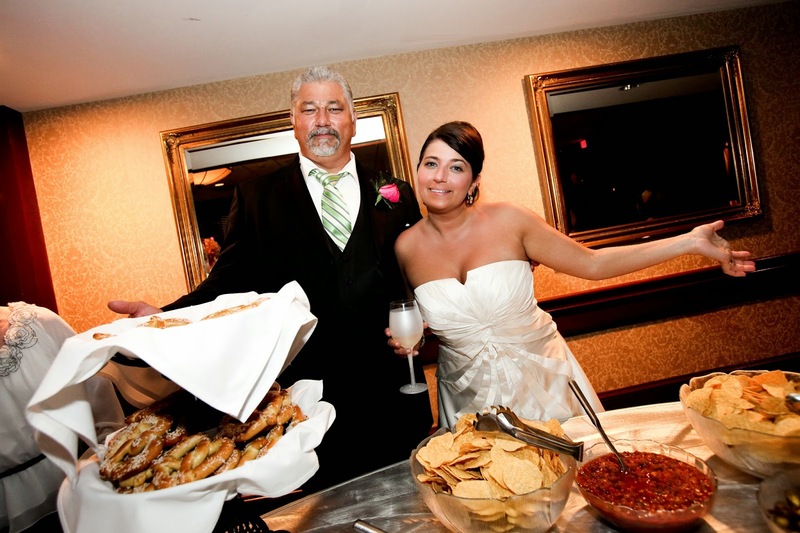 (That's my dad and I cheesing it up with some late night snacks at my nuptials). If you are over Pinterest perfect images, then stay off the site! Sometimes I’m rather thankful Pinterest wasn’t around when we got married. The ideas that we incorporated into our wedding were uniquely ours which added a nice personal touch to our wedding. If you must go on the site, make sure you are staying true to who you are as a couple. And don’t go overboard – it’s just one day and as long as you have a venue, a dress, someone to marry you, and OF COURSE your groom, you’ll be all good. If you have had enough with sweet favors, think outside of the candy box. Customized temporary tattoos, personalized wedding sunglasses or a copy of songs from the reception on a jump drive! If you are over shots of the bride walking down the aisle with cell phones in the air, ask people to keep your ceremony camera phone free. In a world of wedding hashtags, it’s okay to ask for guests to remain phone free during your ceremony! The stalkers will certainly be pissed!